In our Winter 2013 grant cycle, MRG Foundation awarded funding to grassroots groups working on a broad cross-section of issues affecting LGBTQ communities throughout Oregon. Awardees include the Bend-based Human Dignity Coalition, Lotus Rising Project in Ashland, and PFLAG Portland Black Chapter. This year, much of the progressive community’s attention will be focused on marriage equality – and rightfully so. And, in many ways, securing the freedom to marry in Oregon is starting to feel like a slam dunk with both a promising court case and a potential ballot measure moving forward rapidly. But even if we win marriage equality there are still a broad cross-section of issues confronting the LGBTQ community. Which is why MRG’s grantees are working to build safe schools and welcoming communities for LGBTQ youth across Oregon. Creating safe and affirming spaces for young people is one of the most pressing issues in the LGBTQ community if we’re going to push back a growing trend of homelessness and violence against LGBTQ young people. To that end, Human Dignity Coalition and Lotus Rising Project trains and organizes LGBTQ high school leaders and helps them launch gay/straight alliances. 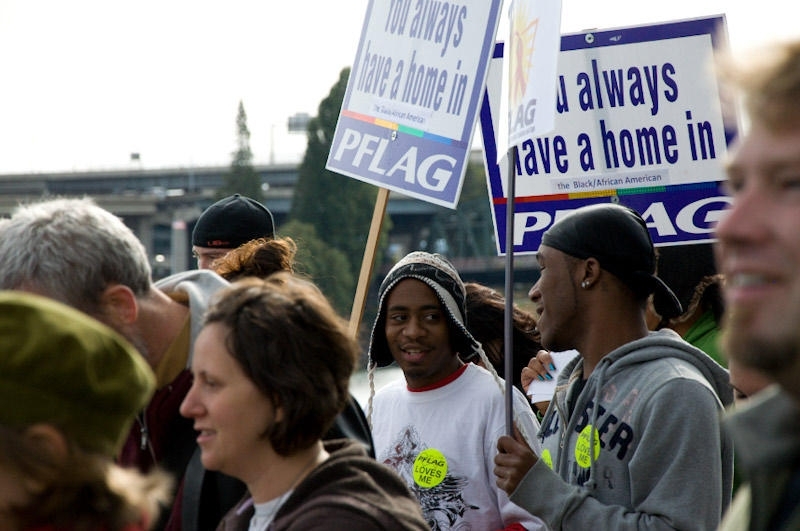 And PFLAG Portland Black Chapter works to empower and mobilize queer youth of color. All three organizations work to empower young LGBTQ leaders, mobilize wider community support, and host pride events in rural communities and communities of color to increase visibility and sense of community among LGBTQ Oregonians. We know that, alongside allies like Causa Oregon, Umatilla Morrow Alternatives, and Cascade AIDS Project, our grantees will help create a state where LGBTQ Oregonians can thrive. PFLAG (Parents, Families and Friends of Lesbians and Gays) Portland Black Chapter promotes the health and well-being of specifically Black gay, bisexual, transgender, and queer (LGBTQ) people, their families and friends through support, education, organizing and advocacy. This organization is the first African American chapter of PFLAG in the nation.